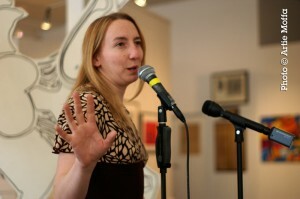 The Boston Poetry Slam has presented a free poetry slam in conjunction with the Attleboro Arts Museum annually since 2007! This year’s special event will feature the Boston Poetry Slam Team, the Providence Poetry Slam Team, the Seven Hills Slam from Worcester, and an open mic featuring YOU, all hosted by BPS SlamMaster Simone Beaubien. As always, the show is held in the main room of the Museum at 86 Park St. in Attleboro, and the event is free of charge. This year’s event will differ from past presentations: an open mic for members of the Attleboro community and beyond will kick off the night. After the open mic, teams from the Boston Poetry Slam, the Providence Poetry Slam, and the Seven Hills Slam will go head-to-head-to-head in a performance poetry exhibition! These three freshly selected teams will be shaking out their metaphors in preparation for their trip to the National Poetry Slam in Oakland, California this August. The Attleboro Arts Museum is located at 86 Park St. in Attleboro, Mass., just a short walk from the Attleboro stop on the Providence/Boston line of the Commuter Rail. Signups for the open mic begin at 6:30pm, with the open mic starting at 7:00. A poetry slam featuring teams from Boston, Providence, and Worcester will begin at the end of the open mic, around 8:00. The show is all ages and admission is free.